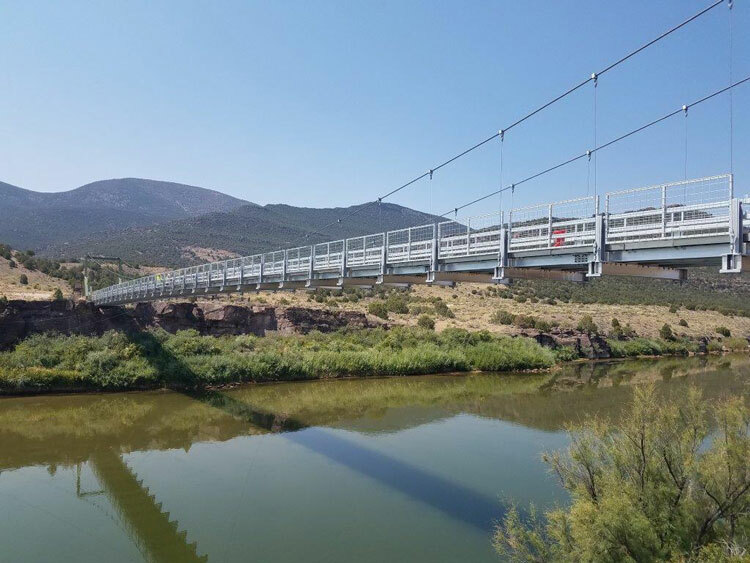 Moffat County, Colo. — AlumaBridge aluminum decking and support beams have been installed on the Browns Park Bridge, a swinging bridge that spans 320 feet. The all-aluminum superstructure is highly durable and virtually maintenance free in the arid mountain climate and is anticipated to reliably serve the Browns Park Wildlife Refuge well into the next century. Compared to the original timber decking, the AlumaBridge deck system also offers a solid skid-resistant riding surface. According to news reports, improvements increased the structure’s capacity from a 3-ton limit to a limit of 14 tons and improved access across the bridge for firefighters, hunters, and other private and business entities that were previously unable to use Swinging Bridge. Closure of the bridge was the result of a tractor that fell through the bridge’s wooden deck in June 2014. As with most bridge rehabilitations, deck weight is critical. Lightweight aluminum decking and beams were ideal for this bridge application. Lightweight modular components also greatly facilitated construction over the Green River. The contractor was able to implement cost effective delivery methods to efficiently install the components. The erection equipment consisted of hand operated trolleys and a simple overhead crane rail. Overall, the consistency and predictability of deck panel dimensions exceeded the Owners’ expectations. Next ArticleDresdner Robin completes design work on The Cambridge Club in Monmouth County, N.J.